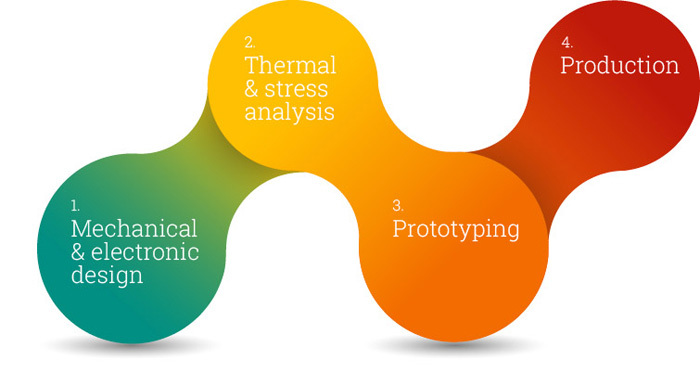 From concept through to supply, European Thermodynamics offer complete thermal management solutions across the whole design development spectrum, our specialist knowledge and expertise can turn the most complex ideas into reality. Working with us means that you can take advantage our market-leading research and knowledge to outperform your competition and achieve superior results. Starting with an initial idea, concept or thermal problem, we go through the engineering design process and produce a mechanical or electronic technical drawing. Next, using our wide range of thermal and stress analysis tools, we ensure that the design will perform continuously in the required conditions. Then a prototype is developed and tested by our in-house workshop. Finally, production begins, many components are made here in the UK and others are produced by our facilities abroad. The best way to find out if we can help you is by contacting us today, call us +44(0)116 279 6899, e-mail info@etdyn.com or visit our contact page to get in touch. To see examples of some recent work, visit client projects. "We work with European Thermodynamics on various projects including; Prestege, PrinTEG and Powerdriver. Working with ETDYN enables us to develop our thermoelectric technologies and products to remain competitive in the market. ETDYN are the leading company in the thermal management technology and are committed to innovation and development which is why we continue to work with them." Dr. Richard Dixon, Managing Director and Global CTO, Intrinsiq Materials.